Our motto here at HelloGiggles right now is “self-care.” That is, taking care of ourselves in a time when we all really, really need it. Some methods take the form of distraction, while others manage stress and difficult emotions. And then there is laughter with its medically-proven health benefits. Because what is more effective than pure, unadulterated mirth to help get us through the bad times? 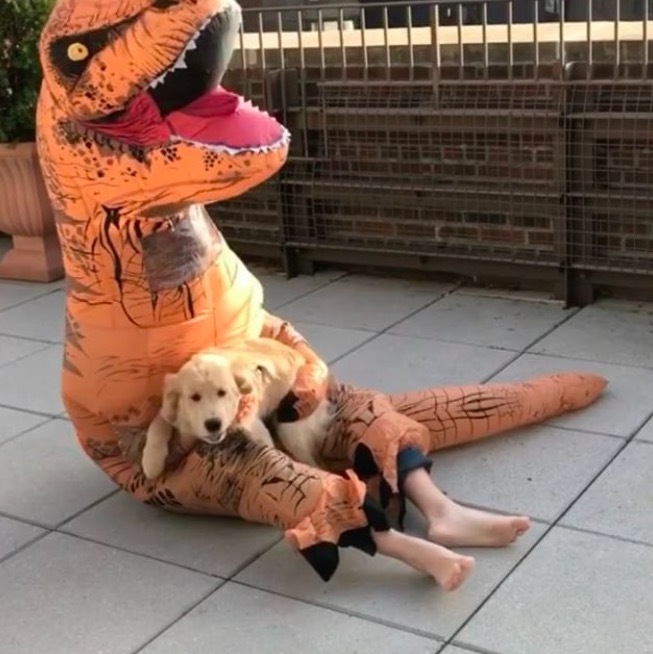 In this vein, we’d like to bring you this incredibly uplifting video featuring a golden puppy and a man dressed up as a dinosaur in one of modern history’s greatest displays of friendship. Without further ado, we interrupt your regularly scheduled internet surfing to bring you this healing clip of a dog meeting a tyrannosaurus rex. First, the little pup appears scared. We mean, who wouldn’t be afraid of a T-rex barreling at them at full speed? But his curiosity gets the best of him and he creeps over to get a closer look. Then the magic happens: The dog registers that the dino is friend, not foe, and his excitement is truly palpable through all the jumping and tail-wagging. If you’re anything like us — and the thousands of others who have watched the video — you’ll have this clip on loop for at least the next 20 minutes. With over 200,000 views on the original video, posted a couple months back, and almost 60,000 views on a repost from Instagram account A DailyDoseOfDog, and an ESPN segment, this lil pup has found fame. If you weren’t a fan of Bucky before, you sure are now. Nothing is cuter than this little guy. Now, back to watching Bucky and Rex go from strangers to BFFs. We could do this allll day.